Colonel Gian Gentile’s 2008 article “Misreading the Surge” in World Politics Review first exposed a growing rift among military intellectuals that has since been playing out in strategy sessions at the Pentagon, in classrooms at military academies, and on the pages of the New York Times. While the past years of U.S. strategy in Afghanistan have been dominated by the doctrine of counterinsurgency (COIN), Gentile and a small group of dissident officers and defense analysts have questioned the necessity and efficacy of COIN—essentially armed nation-building—in achieving the United States’ limited core policy objective in Afghanistan: the destruction of Al Qaeda. 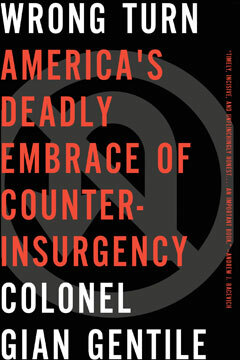 Drawing both on the author’s experiences as a combat battalion commander in the Iraq War and his research into the application of counterinsurgency in a variety of historical contexts, Wrong Turn is a brilliant summation of Gentile’s views of the failures of COIN, as well as a searing reevaluation of the current state of affairs in Afghanistan. As the issue of America’s withdrawal from Afghanistan inevitably rises to the top of the national agenda, Wrong Turn will be a major new touchstone for what went wrong and a vital new guide to the way forward. Note: the ideas in this book are the author’s alone, not the Department of Defense’s.